The first game official inducted by the NPASHF, Mihalik had a remarkable career that spanned 40 years, including working six NCAA tournaments, three NIT tournaments and two Olympics – 1964 in Tokyo and 1968 in Mexico City. He worked some games in the NBA, but preferred the amateur and collegiate ranks. He was named the best basketball official in the United States in 1951. Mihalik’s officiating career started quite by accident one snowy evening in his native Ford City, Pennsylvania when referees were delayed by a winter storm, Mihalik was “volunteered” to officiate. He discovered he enjoyed it, and later decided to pursue it as a career after his high school playing days were over. Michalik died in 1996. We frequently recognize the achievements of amateur and professional athletes, but we seldom pay much attention to the contributions of a group of people who are an integral part of sports: the referees! They play a critical role in athletics, yet we usually don’t even notice them unless they make a mistake – or at least what we think is a mistake. 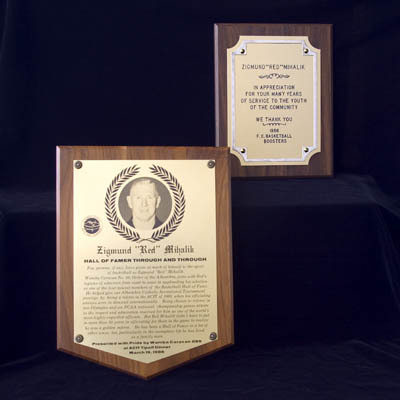 Red Mihalik was one of the few officials in any sport who, because of his extraordinary fairness, commitment, knowledge, and integrity, gained widespread recognition and acclaim. In 1996 Zigmund “Red” Mihalik became the first person selected to the National Polish-American Sports Hall of Fame as an official. Chosen by the Hall’s Veterans’ Committee, Mihalik had a remarkable basketball officiating career that spanned more than 40 years and included the Olympic Games and the NCAA Finals. Red Mihalik might never have become a basketball official were it not for one snowy night more than 60 years ago in Ford City, Pennsylvania. Mihalik was a teenager getting ready for a basketball game that didn’t start because a winter storm had delayed the referees. As Red recalled: “We waited and waited a while. 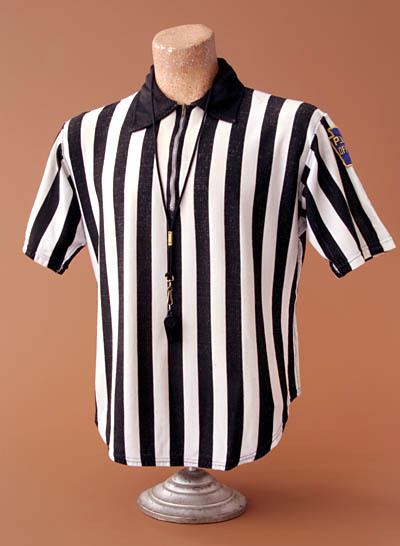 Then the coach comes over to me and another guy and hands us whistles and says, ‘Here, you’re officiating tonight.’” Red discovered that he enjoyed officiating, and would later decide to pursue it after his high school playing days were over. Red was born on September 22, 1916 in Ford City to Polish immigrant parents who settled in Pennsylvania in the early 1900s. He and his brothers, Clem and Karl, all became outstanding all-around athletes. While in high school, Red received a number of scholarship offers, but his father died and “someone had to work in the family.” In addition to his regular employment, he earned a little extra money officiating high school games throughout Pennsylvania. When World War II began Mihalik served in the Air Force, where he continued to play and referee basketball. Shortly after returning to civilian life he began refereeing on the collegiate level. Red mostly worked for a beverage distributor when not officiating, but soon found himself in great demand as a referee around the country. Mihalik worked his first of six NCAA championship finals in 1956, and also officiated three National Invitational Tournaments. He worked some games in the National Basketball Association, but preferred officiating in the amateur and collegiate ranks. His experience included various collegiate games and tournaments in the Big Ten, Atlantic Coast, and many conferences. It was about that time that knee problems forced Red to give up officiating on the international and major college level. However, because of his passion for basketball and love of young people, the man who refereed in the NCAA Finals and the Olympics continued to referee high school and women’s college basketball. “Every game, whether it’s high school, college, or a tournament championship, is the same to me,” he once said. Mihalik and his wife Helen had no children, but he had a profound influence on the lives of many young people. Basketball was his first love, but he also worked as a baseball umpire and a football referee as well as a scorekeeper and timer. A dynamic speaker, Red never passed up an opportunity to talk to young people. He was a beloved figure in Ford City, where a gymnasium and a softball field were named in his honor. In 1986, thanks to an effort initiated by North Carolina Coach Dean Smith, Red was inducted into the Naismith Memorial Basketball Hall of Fame in Springfield Massachusetts. That same year, the 69-year-old Mihalik officiated his last game, a contest involving seventh and eighth graders in Kittanning, Pennsylvania. Red Mihalik enjoyed an illustrious officiating career that lasted more than four decades, and was widely recognized as one of the best in his chosen field. Yet, perhaps his true legacy is not to be found in the number of Olympics or NCAA Finals he officiated, but in the role he played in enriching the lives of the countless young men and women, teaching them the true meaning of sports and imparting the principles of fair play, discipline and respect. In a profession that rarely gets its due recognition, the many honors accorded him clearly demonstrate the great love, respect and admiration that so many people have for Zigmund “Red” Mihalik.